According to 2017 statistics from the Washington State Department of Transportation (WSDOT), distracted driving causes thousands of car accidents in Washington. In fact, 11,508 car accidents occurred last year from a distracted driver. 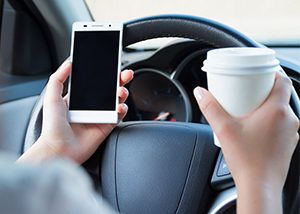 One of the newest rules of the road in Washington relates to distracted driving, and specifically the use of cell phones and other devices while driving. The law, which went into effect in 2017, prohibits the use of cell phones while driving, stopped in traffic or at a stop light. This includes tablets, laptops, games or other hand-held electronic devices. Drivers cannot watch movies while driving. Hands-free use is limited to a single touch or swipe. As part of the new distracted driving law, drivers who can also get a ticket for other types of distractions such as grooming, smoking, eating or reading if the activity interferes with safe driving and drivers are pulled over for another traffic offense. RCW 46.61.672: Using a personal electronic device while driving. (1) A person who uses a personal electronic device while driving a motor vehicle on a public highway is guilty of a traffic infraction and must pay a fine as provided in RCW 46.63.110(3). (d) A person operating an authorized emergency vehicle. (3) The state preempts the field of regulating the use of personal electronic devices in motor vehicles while driving, and this section supersedes any local laws, ordinances, orders, rules, or regulations enacted by any political subdivision or municipality to regulate the use of a personal electronic device by the operator of a motor vehicle. (4) A second or subsequent offense under this section is subject to two times the penalty amount under RCW 46.63.110. (a) “Driving” means to operate a motor vehicle on a public highway, including while temporarily stationary because of traffic, a traffic control device, or other momentary delays. “Driving” does not include when the vehicle has pulled over to the side of, or off of, an active roadway and has stopped in a location where it can safely remain stationary. (b) “Personal electronic device” means any portable electronic device that is capable of wireless communication or electronic data retrieval and is not manufactured primarily for hands-free use in a motor vehicle. “Personal electronic device” includes, but is not limited to, a cell phone, tablet, laptop, two-way messaging device, or electronic game. “Personal electronic device” does not include two-way radio, citizens band radio, or amateur radio equipment. RCW 46.61.673: Dangerously distracted driving. (1)(a) It is a traffic infraction to drive dangerously distracted. Any driver who commits this infraction must be assessed a base penalty of thirty dollars. (b) Enforcement of the infraction of driving dangerously distracted may be accomplished only as a secondary action when a driver of a motor vehicle has been detained for a suspected violation of a separate traffic infraction or an equivalent local ordinance. (c) For the purposes of this section, “dangerously distracted” means a person who engages in any activity not related to the actual operation of a motor vehicle in a manner that interferes with the safe operation of such motor vehicle on any highway. (2) The additional monetary penalty imposed under this section must be deposited into the distracted driving prevention account created in subsection (3) of this section. (3) The distracted driving prevention account is created in the state treasury. All receipts from the base penalty in subsection (1) of this section must be deposited into the account. Moneys in the account may be spent only after appropriation. Expenditures from the account may be used only to support programs dedicated to reducing distracted driving and improving driver education on distracted driving. Contact the car accident lawyers in Spokane at Parke Gordon Law Firm if you’ve been injured in a car crash. Our experienced and exceptional attorneys will work hard to get you every penny you are owed. Parke Gordon Law Firm believes every client deserves top-tier representation against big insurance companies with deep pockets. Call our Spokane law office today at (509) 482-7274 for a free consultation. We can usually tell you over the phone if you have a good case. You pay nothing until your case is settled.